In October the Bath Theatre Royal will give a rare opportunity to see two pre-eminent actors performing In Praise of Love in the intimate setting of the Ustinov Studio. Robert Lindsay & Tara Fitzgerald will star in Terence Rattigan’s last play, a perceptive and powerful drama about the concealed truths and veiled emotions in a marriage. Sebastian and Lydia Crutwell live in a small flat in Islington. Sebastian, once a promising novelist, is now a cantankerous critic. Lydia, an Estonian refugee, has recently discovered she is seriously ill, news that she confides to a family, Mark, but not to Sebastian. Over the course of two evenings, a series of heart-breaking revelations changes the facade of Lydia and Sebastian’s relationship forever. Deeply moving and filled with beautifully crafted dialogue, this compelling drama demonstrates Rattigan’s incomparable ability to define the British character. The play will be directed by Jonathan Church who during his time as Artistic Director of the Chichester Festival Theatre proved himself to be a champion of Rattigan’s work mounting several productions and rehearsed readings in the anniversary year. Evening performances at 7.45pm, matinees (Wednesday & Saturday) at 2.30pm. In November the Royal Central School of Speech and Drama will be mounting Flare Path partly financed by the society’s Harold & Pegs French Award generously funded by Holly Hill. Imagine full houses for Terence Rattigan’s plays in fifty, one hundred, hundreds of years from now. 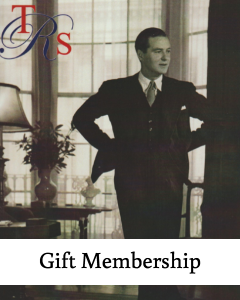 Happy thoughts, and a goal that the TRS can further right now by engaging young theatre professionals’ and playgoers’ enthusiasm and support for Rattigan’s work. With this end in mind, I have committed a yearly sum to the Society. Our Committee brilliantly suggested that this could be used to support a production of a Rattigan play each year by a drama school. And to develop the new programme, the Committee found the superbly qualified Professor Michael Gaunt. A theatre director; acting teacher; drama school principal; theatre historian and also Chairman of The Society for Theatre Research and a Fellow of the Royal Scottish Academy of Music and Drama. Prof. Gaunt generously accepted the Committee’s invitation to join it as Drama Liaison Director. Michael has arranged for the Royal Central School of Drama (whose alumni include Olivier, Ashcroft, Dench, four Redgraves, Michael Grandage and relative youngsters Andrew Garfield and Kit Harrington) to stage Flare Path. TRS members are invited to the Saturday, 24 November performance. I well remember the great kindness shown to me by Pegs French while I was working on my Ph.D dissertation A Critical Analysis of the Plays of Terence Rattigan. In the summer of 1975, Pegs, acting as Sir Terence’s personal assistant, welcomed me into his Albany chambers to work with his papers. I was allowed to take away, study and copy everything, including his juvenilia, the three versions of The Deep Blue Sea, his scrapbooks of press cuttings and countless other treasures now in the British Library. I was nervous all the time that my bedsit might burn down, or I’d be hit by a car and the papers I was carrying would scatter. What a priceless privilege I was given (and what a clever and kind way to keep a graduate student from being underfoot in Sir Terence’s home). After Sir Terence’s death, I saw Harold and Pegs frequently in London. We had silly fun—Harold won the Snooker tournament at his club and wore the Snooker Champion shirt I had made for him; Pegs and I met for lunch and tea—once we were at the Ritz tearoom when all the guests were asked to go out into the garden because of a fire alarm upstairs. Several glasses of champagne later, I asked for the bill and we were told that there was none; the Ritz apologized for our inconvenience! We celebrated when I was named New York Theatre Correspondent for The Times in 1984; I was very grateful that they knew that the student to whom they were so nice was having a success. So, for all that Harold and Pegs French meant to me and, more importantly, for all that they meant to Rattigan and Rattigan meant to them, I am thrilled that the TRS will have a component known as The French Fund—short for The Harold and Pegs French Memorial Fund. 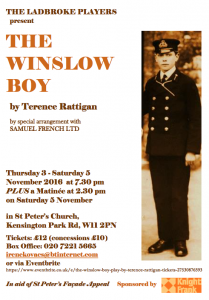 I hope that Society members will come to the 24 November performance of Flare Path at the Royal Central School of Drama to support a new generation of theatre artists performing the work of Terence Rattigan. The Society AGM and play-reading of one of the final short listed entries in the play competition, The Rattigan Affair by Lynda Strudwick. Flare Path at the Royal Central School of Speech and Drama. This student production will be assisted by the first French Award, in honour of Harold and Pegs French and sponsored by Dr Holly Hill. A Society visit will be arranged, preceded by a buffet reception. Performance at 2.30pm. The Browning Version and Red Peppers—a double bill directed for the Torbay Operatic and Dramatic Society by our Treasurer Andrew Kenyon. The Deep Blue Sea is performed at Wokingham Theatre from 3-12 May – some seats are still available through their website (click here). 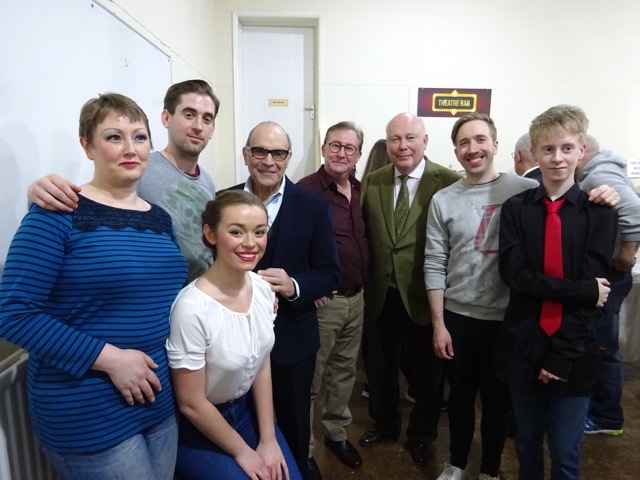 From Left to Right: Lainey Shaw, Edward Broomfield, Johanna Pearson-Farr (TRS President, David Suchet) Clive Greenwood, (TRS Vice President, Julian Fellowes), Stephen Martin-Bradley, and Edward Bloomfield (aged 14) making his professional debut. Please Click Here for details of all seventeen final plays, which The TRS would like to recommend for future production. The Society has arranged a visit to the Sarah Thorne Theatre in Broadstairs, Kent on Saturday 17th February 2018 to see ‘The Onion at the End’ by Roy Kendall. The winner of the Terence Rattigan Society Award, this World Premier is set in a seaside town in the 1930s. Two entertainers who share the same dressing room but otherwise little in common team up as a comedy act with resulting issues for them, their landlady and her son, plus a theatre producer always on the lookout for future stars! Julian Fellowes (The Lord Fellowes of West Stafford D.L) presented Roy with a cheque for £2,500 at the ceremony at Harrow School and the other half of the prize was a professional performance of the play at the Sarah Thorne Theatre in Broadstairs by The Sarah Thorne Theatre Company. 1.45-2.30pm: Join us in the theatre bar for a glass of prosecco before the play. 2.30pm: ‘The Onion at the End’ will be performed. Approx 4.30pm: There will be an opportunity to meet the cast of the play and enjoy a buffet tea of sandwiches, rolls, savouries, meat platter, cheese platter and assorted cakes and a cup of tea or coffee. Alcoholic drinks can be purchased from the theatre bar. Please Download the Booking Form Here to find out more information and book your place. Click Here to See the Poster. The Society has reserved a lovely private room, overlooking the river, on the second floor of Doggett’s public house on the corner of Blackfriars Bridge (South Side). It seats 90 theatre style, so do bring guests. 11.a.m. prompt. THE PLAY READING. ‘Going Back’ by Roy Chatfield. Roy Chatfield took second prize in The Terence Rattigan Society Award, with his play ‘Going Back’. Julian Fellowes (The Lord Fellowes of West Stafford D.L) presented him with a cheque for £1,000 at the ceremony at Harrow School and the other half of the prize was a rehearsed reading of the play for members of the TRS and their guests. This play alternates between two contrasting worlds – utterly dysfunctional Africa and a cosy, claustophobic world of suburban middle-class England. After six years as the hostage of African rebels, Jules returns home determined to pick up his life where he left it, but his experiences have irrevocably changed him and his family appear not to be the people they were. It is a ‘Rattiganesque’ play in that its broad canvas is coltan mining, hostage-taking and politics, but in fact it is all about people and relationships. 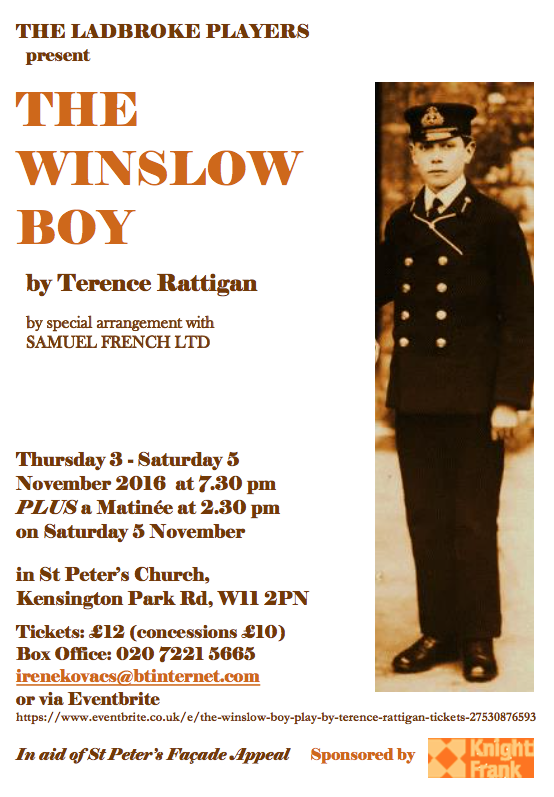 Adrian Brown, who was a close friend of Terence Rattigan, is directing and readers include Emily Laing, Giles Cole and Sean Garvey. 12.30/1.p.m. CHRISTMAS BUFFET LUNCH, large selection including turkey/stuffing & cranberry sandwiches, scampi and tartare sauce, cumberland pigs in blankets, chilly chicken skewers, salads, chips, cheese, mince pies and brandy sauce. There will be a private bar adjacent to the meeting room and house wine is £17.95 per bottle. This will take place at some point during lunch and will be chaired, with his usual clarity (and brevity), by our Secretary, Group Captain Clive Montellier, OBE., RAF. Please download the booking form here. 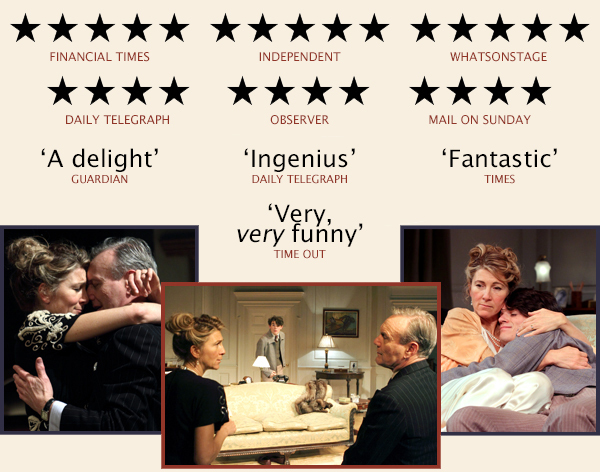 Love in Idleness, directed by Trevor Nunn is transferring to the Apollo Theatre for 7 weeks only (50 performances) from 11th May. 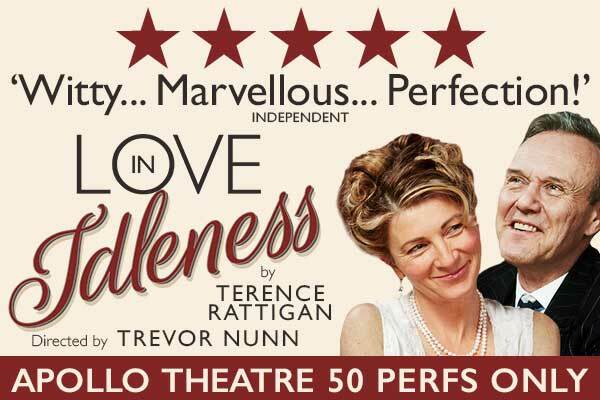 Anthony Head (Buffy the Vampire Slayer) and Helen George (Call the Midwife) lead the cast of Terence Rattigan’s Love in Idleness, which is being revived by Trevor Nunn at the Menier Chocolate Factory from 10th March to 29th April. The play tells of an 18-year-old who returns from Canada during the war and is shocked to find his widowed mother is now the mistress of a cabinet minister. Check out this Theatre by the Lake production of Terence Rattigan’s “After the Dance”. On from Fri 26 May – Sat 4 November 2017. More details and booking information can be found here. A dazzling dissection of love, class and the capacity for self-deceit. David and Joan Scott-Fowler were Bright Young Things of the 1920s and live a glamorous life of hedonism and pleasure: debauched parties, serious drinking, sparkling wit and superficiality. But times have moved on and they are no longer as bright or as young as they once were. When a young and idealistic couple come into their lives, they begin to realise that the gaiety of their youth is wearing thin and the precarious game around which their existence is constructed begins to fall apart. Sharply satirical and heartrendingly beautiful, After the Dance is about a world on the cusp of enormous change. Neglected for many years, it is now considered to be one of the great works of a master dramatist.